The fit of these jackets has ever been really perfect. I had never been able to find a true summer weight vented textile jacket that met my needs for fit, protection, and ventilation so I endured just a heavy textile even in 110 degree plus temperatures. From the first time that I put the Metralla on and headed out for a ride I was a fan. And the more that I wear it, the more I like it. In fact, it was hard for me to come up with any real solid issues to list as cons for this jacket. Being that I live in a very warm climate, I was eager to test any jacket that offered good ventilation as well as solid protection. And the added benefit of the Motonation Metralla being designed for a woman was an added bonus that doesn’t come along very often. I ride in men’s jackets most of the time and rotate between a textile jacket with awesome protection and a full leather jacket with a Dainese Manis D1 and titanium shoulder protection depending on the season. I was really eager to get my hands on this jacket and test it out. I was trying to manage my expectations but I had really high hopes of finally finding a jacket that was cut to fit a woman while still offering protection and great airflow. As soon as I opened the box I was pretty excited that the coat actually had the shape that looked like it was going to fit me. Before I get too much more into the jacket itself, I want to talk just a little bit about the shipping from Motonation. The box was well taped and made it through the shipping process very well. And when I opened the box I was very happy to see each item was carefully folded, wrapped in plastic and carefully packed in the box. It really looked like someone took a minute and cared about packaging my items so that they would arrive in perfect condition, which they did, and I appreciate that. Just one step in the customer service process but one that Motonation handles very well. As a company, they have been superb to work with which is not always the case with online orders. Anyway back to the Motonation Metralla Ladies vented textile jacket. The jacket looks great in a very basic black and white color scheme. I am normally not a fan of black gear due to the added heat in my area of Phoenix, Arizona but the black front and back panels are very functional. My textile jacket is all white and it looks a little grungy most of the time from bugs and other spots. The white along the sides of the jacket and the sleeves give it a crisp look but in a more protected location that doesn’t show the dirt as much as a full white jacket. The accordion fabric Spandex panels on each side grabbed my attention. Holding the Metralla up by the shoulder pads I could easily see the slight hourglass shape of the coat, which made me both excited and a little apprehensive. I was hoping for a great fit but also hoping that I wasn’t too fat for this great jacket. A few other features jumped out at me as well even before I tried on the jacket. The zippers are heavy duty and appear to be durable which is a big plus for me. Nothing is worse than a jacket that you love but are forced to retire because of low quality or poorly designed closures. Another small detail but one that caught my eye was the hook and loop collar tie back. It allows you to leave the collar open for better airflow without the tab beating against your throat or chin at speed. Overall I was pretty wowed by the Metralla even before I tried it on! After a quick once over, I was off to try on the Metralla in front of a mirror. I hate to admit it, but I care about both how it fits/feels and how it looks. I kind of hate to include this but I feel like its a part of my job so I will add that I am 5’ 10” tall and weigh 153 pounds to give readers a frame of reference for my size. Sliding my arm in, I was very happy with the roominess of the sleeves and the length. I have fairly long arms for a woman and that often is the reason that a jacket doesn’t fit me. In addition, the shoulders fit me very well which is also rare. I have been told that I have broad shoulders and I guess I agree. Once while shopping for a dress to wear to a wedding, a sweet older lady who was helping me politely whispered that I should stay away from sleeveless dresses as they made me look like a linebacker. Brutally honest advice but helpful. I rarely buy dresses but I think of her each time I try on a ladies jacket and hope the shoulders are cut more generously. Zipping the jacket was really easy as the large zipper and added pull tab make it simple. I felt the body of the coat become a little snug around me but it never felt too tight or constricting. I was really happy that no diet would be needed before the actual testing could begin. Standing in the mirror I did the usual motions of raising my arms and twisting to see how the jacket felt and if it would move with me or bind. I was happy to find not a single place that was uncomfortable, tight or cutting into me in any way. Next, I adjusted the waist straps and the sleeve gathers for a perfect custom fit. The Motonation Metralla was my first experience with any Motonation jacket so I was forced to rely totally on the sizing chart in the catalog. My waist measurement is in the 32-34 inch range and my chest is right about 37 inches. Knowing that the arm length and the shoulders are always difficult for me, I opted to err on the side of larger rather than smaller and ordered a large to accommodate the linebacker shoulders. My reasoning was that the waist was adjustable but the shoulders are a set size. Also, I was fairly sure that I would be adding additional back protection so that would require a little extra space. The cut might be a little on the small side but not any huge discrepancy. 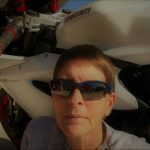 The large is working great for me and allows me a really great range of motion sitting upright or crouched on my Ducati 959. The jacket sells for $119 which is far less than almost all of the other options on the market. Many ladies jackets including those in the $200 plus range only offer a foam back pad so even after adding a back protector this jacket is priced very competitively. Revzilla offers the Alpinestars Stella Wake Air for $199.95 and the Amok Air Drystar for $319.95 which offer comparable ventilation but only a foam back pad as well. 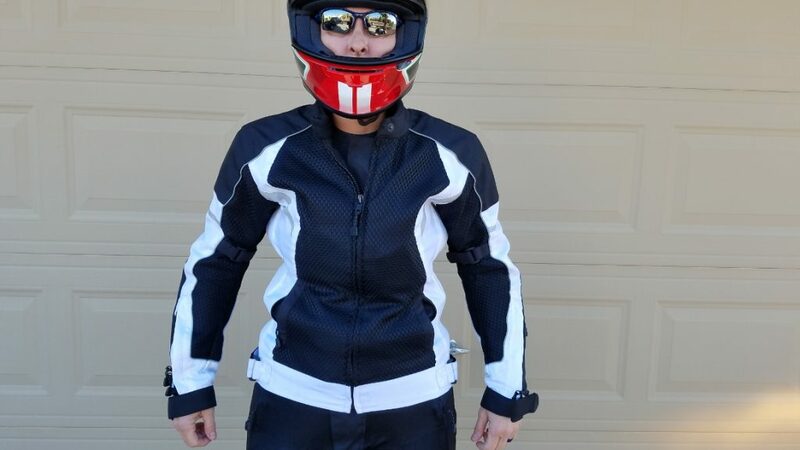 I added an Icon D30 Viper 2 Back Protector which runs about $45 on Revzilla and the total cost is still far less than most other ladies mesh options. The collar of Metralla is very comfortable thanks to the microfiber lining and neoprene used in the construction. 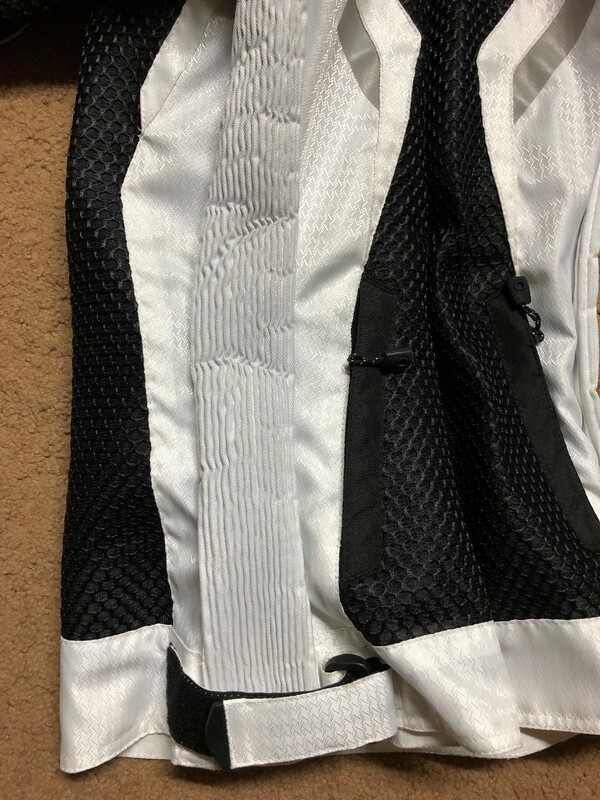 The snap on the collar appears to be a little oversized compared to many that I have seen on jackets but I look at that as a huge plus in the durability category. And as I mentioned earlier, the collar tie back is an awesome feature that I think every jacket should offer. The loop is a thick rubber and the hook is hard plastic so the durability should be pretty reliable. The shoulder armor is made of a high impact CE approved dual-density pad. 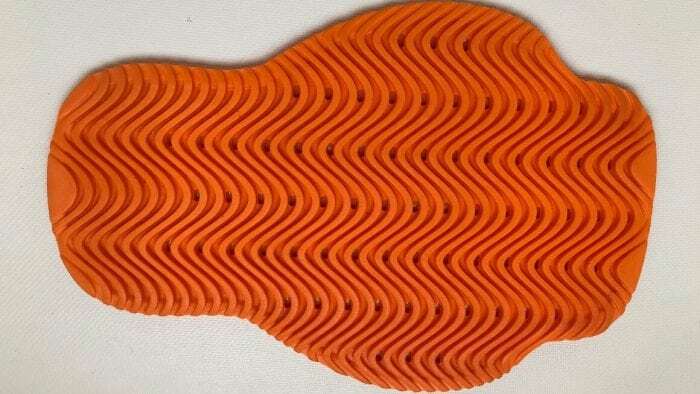 Each pad has a nice curve and is very flexible to accommodate a full range of motion. They are also designed with channels and openings to allow some airflow into the padded areas of the jacket. The protectors are inserted into fairly standard shoulder pockets that are secured with hook and loop tabs. Riders can elect to upgrade to a more protective CE1 or CE2 level armor if desired. The elbow armor is the same material as the shoulder armor and also fits into a hook and loop secured pocket. CE1 and CE2 level armor is also available for the elbows. One of my favorite features on the arms of the Metralla has got to be the sleeve gathers. These are hook and loop secured 1-inch straps that allow you to custom fit the arms of the jacket. This is the simplest solution to flapping jacket arms but one that many manufacturers overlook. What I like is that it lets me tighten the sleeves when I am wearing just a t-shirt or loosen them a bit if the weather is cooler and I have inserted the liner or a sweatshirt. The finishing touch for the sleeves are the 2-way YKK zippers and the cuff closures. The extra long pulls on the zippers make them easy to grab and use even with gloves on. And the 2-way feature allows you to fit the cuff over any set of gloves that you can imagine. In addition, you can open all or part of the zipper area to allow a great amount of airflow up the lower arm area. 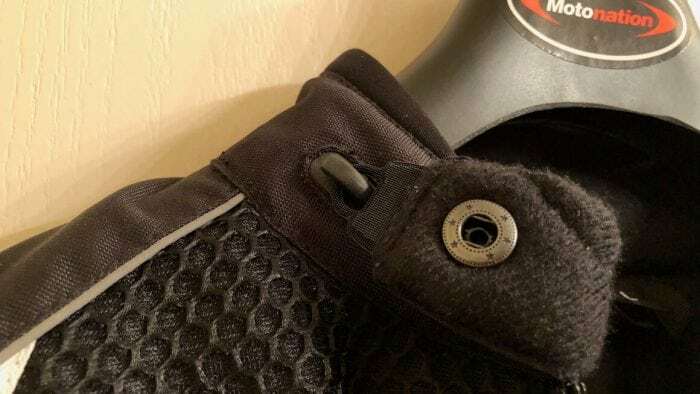 And again, the neoprene and microfiber are included in the cuff for supreme comfort when securely closed with the hook and loop 1.5-inch tabs. 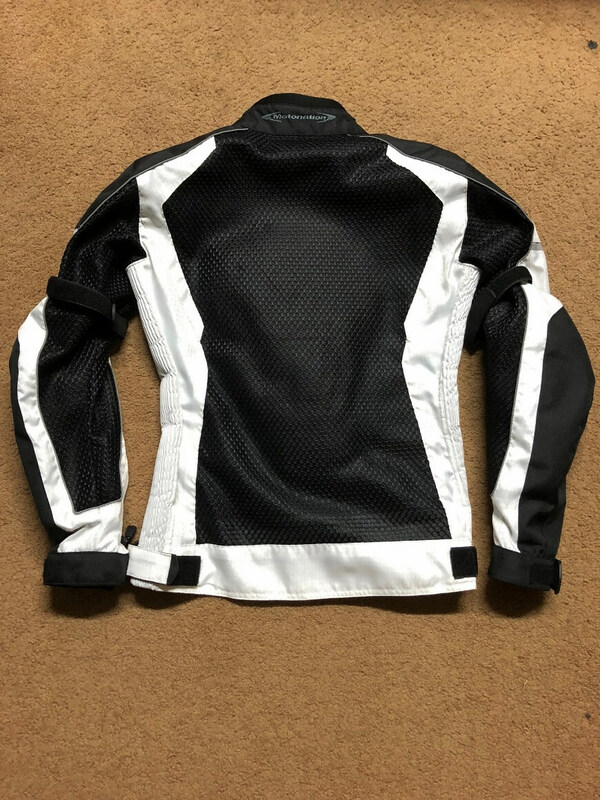 There is a line of reflective piping for added great night visibility that runs from the collar down to a few inches shy of the cuff on the front and back sides each sleeve. 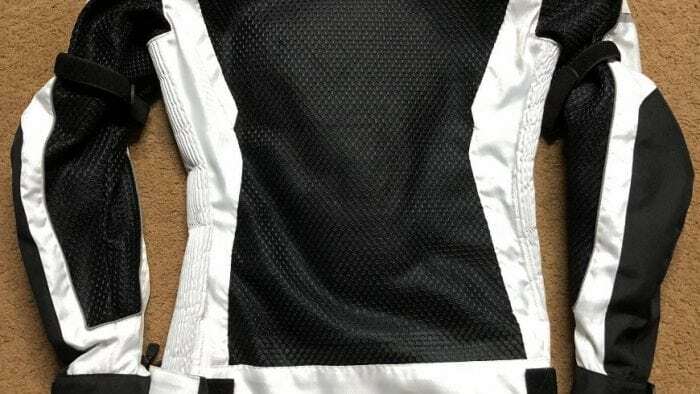 In addition, there is a half inch wide reflective stripe stitched onto each sleeve between the shoulder and elbow and a 1-inch sash from the armpit to the mesh fabric on the front of the jacket. Multiple stitching is also used throughout the shell in all high impact areas to reduce the potential for tearing and skin abrasion. Motonation used huge pore mesh to provide amazing airflow through the arms, chest, and back of the Metralla jacket. I would estimate that the jacket is about 75% Polyester mesh and the remaining portion of the shell is 600 denier Polyester fabric. The entire jacket is then lined with a 100% Polyester anti-bacterial mesh lining which is finer than the exterior mesh fabric. The jacket includes a removable waterproof, windproof and breathable lining. This full lining can be zipped into the jacket and secured in the sleeves with the color-coded tabs at the wrists. The front of the jacket is finished off with two front hand warmer pockets with zipper closures. These pockets are not huge, about 6 inches square, but they are big enough to hold an iPhone. The waist also features 1.5 inches wide hook and loop straps to allow for custom fitting the waist over clothing or when the jacket is attached to a pair of riding pants. This strap runs across the expansion at the waist but is certainly long enough to accommodate having the panel stretched without compromising the ability to secure the hook and loop fasteners. What makes this jacket a standout design for the ladies is the accordion inset on each side of the jacket. The spandex panels run the full length from the armpit to the waist, and each is about 3 inches wide when contracted. But as needed, these panels can actually double in size to a full 6 inches each. This offers a great amount of flexibility when sizing the jacket for additional clothing or to achieve that much desired perfect fit. The panels are also soft enough that they are comfortable when bending or leaning sideways as they give a little, unlike other fabrics. And finally, this is the feature that allows the chest area to be comfortable for ladies of varying sizes and proportions. The inside of the Mertalla features a 7 by 3.5-inch cargo style pocket that expands to almost an inch thick. The pocket is secured with a ¾ inch wide strip of hook and loop on the closure flap. An additional waterproof interior vertical zip pocket is also provided in the shell and is about 6 inches square. The capacity is enough for a phone, wallet or even a glasses case as long as you are comfortable with items stowed in the chest area. And finally, there is an 8 Inch YKK waist connection zipper to attach the Metralla to pants for a full suit feel. The Metralla includes a windproof, waterproof liner that is made of a breathable material called Reissa. This liner zips in over the interior mesh liner. The Reissa liner is full sleeves as well as the body of the jacket which is not always the case with liners. The sleeves of the liner have color-coded snap tabs to secure the sleeves near the wrists for added comfort and a great fit. I have never been a fan of zipping in liners but found this one to be very comfortable. It is roomy enough that you still have a full range of motion and the breathable material helps to eliminate the sticky feeling that occurs with some liners. Adding the liner is great for wet conditions but it also adds an additional bit of function to the jacket as it can be used to eliminate the airflow and serve the same purpose as a heavier textile jacket, making the Metralla an even better bargain. The only aspect of the Metralla that I would even begin to consider a downfall is the 8mm thick memory foam back pad. 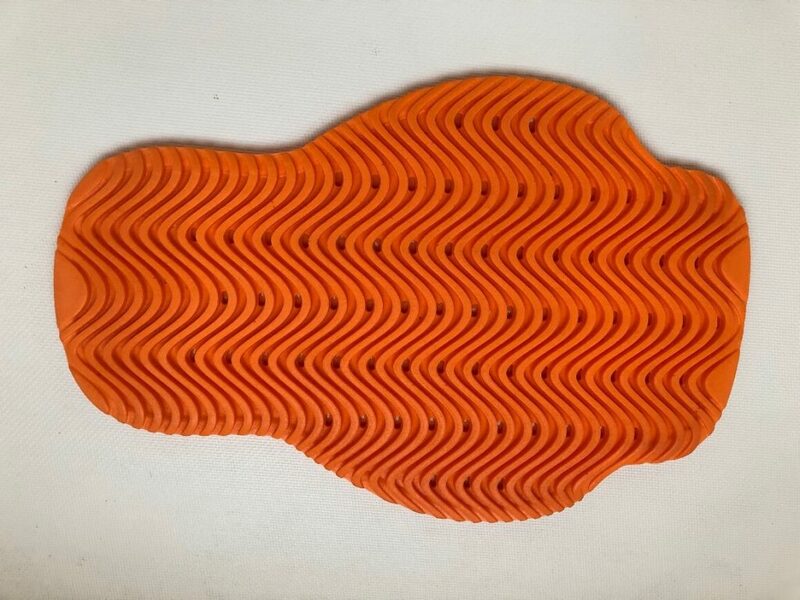 The pad measures about 15.5 inches from top to bottom and is around 9.5 inches at the widest point, so not only is it thin but it is rather small. I prefer to have a little more protection for my back not only for impact but also to endure more abrasion should I be forced to slide. I removed the memory foam pad and replaced it with an Icon D30 Viper 2 pad which offers CE Level 2 protection. The D30 is slightly larger, 16 inches by about 10.5 inches so it was tough to get into the back pad pocket and is slightly curved when in the pocket. But it functions well and is comfortable as the curve wraps around my back and shoulders a bit. And for $45 it was an easy fix to make this pretty much my perfect summer weight jacket. I have worn this jacket quite a bit since it arrived. I liked it from the first ride and am finding that I like it even more as I continue to use it and enjoy the great airflow and comfort that it offers. I hope that I never need to put the armor to the test but I am very confident that it will do its job as well. 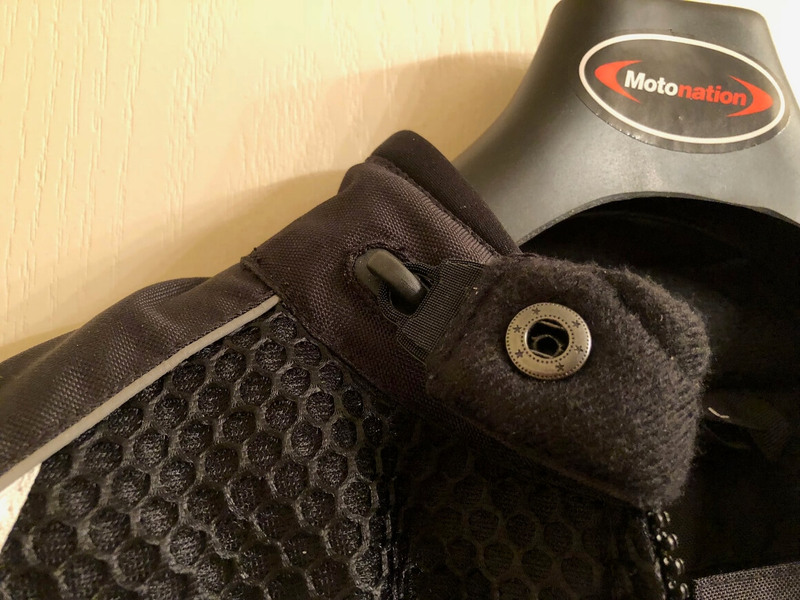 I have worn a lot of big name jackets over the years including Icon, Joe Rocket, and Dainese and I have paid a lot more for each of those jackets than the very reasonable cost of $119 that Motonation is asking for the Metralla. But I have never been as satisfied with any of the big name, expensive jackets as I am with this one. I’m a huge fan of the Metralla. It is well worth the price and I would venture to say that it is even worth twice the price. The Metralla is a great design for ladies and offers great ventilation for riding in hot weather. 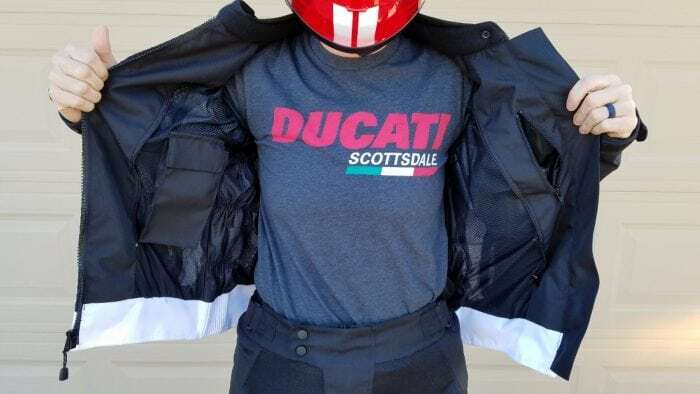 The option to add the waterproof and windproof liner also makes this a very versatile jacket that can meet the needs of a summer riding or even cooler spring and fall weather. 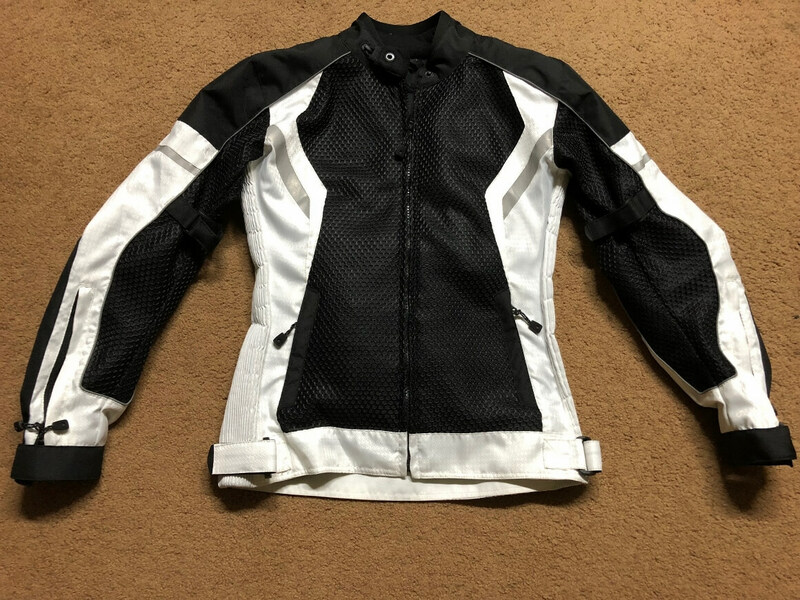 This is a great jacket for ladies who are new to riding as it offers great protection and is affordable but it will also meet the needs of the more experienced riders who are willing to spend more on a jacket. Don’t waste the money, buy the Metralla and get a great deal and a great jacket.